This commentary is emphatically not an endorsement of Trump as President. I have not voted since 1992 because, when the system gives the public a Hobson’s Choice, voting is pointless. The graphic above (sourced from Northman Trader) was prepared by Deutsche Bank and the data is from the Fed. 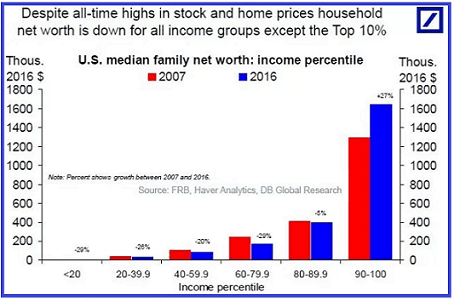 It shows that, since 2007 through 2016, U.S. median household net worth declined between 2007 and 2016 for all income groups except the top 10%. Given that a Democrat occupied the Oval Office between 2008-2016, and given that the economic condition of 90% of all households declined during that period, it follows logically that empty promises of a Republican sounded better to the general population of voters than the empty promises of a Democrat. In other words, the “deplorables” didn’t vote for Trump because they wanted a wall between the U.S. and Mexico or they wanted to nuke North Korea off the map, they voted for a Republican because the previous Democrat took money from their savings account.